Serving areas: Mecklenburg County (Charlotte), Union County (Monroe), and parts of South Carolina. 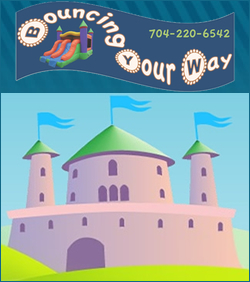 Bouncing Your Way offers a variety of party rentals including: bounce houses, obstacle courses, dry slides, Slip n Slides, water slides, bouncer/slide combos, tents, tables, chairs, concession machines, pucker powder and Spin-Art Machines for T-Shirts, Frisbees and cards! We are a family owned and operated company focusing on prompt and reliable service, impeccably clean units, and most importantly SAFETY rivaled by no others. 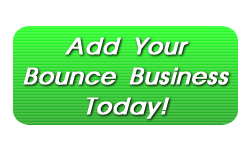 Laugh N Leap is Columbia’s number one inflatable bounce house rental business. Whether its a Water Slide, Bounce and Slide combo, Obstacle Course, or more – Laugh N Leap schedule’s your bounce rental with our Do It Yourself Reservation System Online. Book your party rental today and ensure the best play Birthday party or event ever!